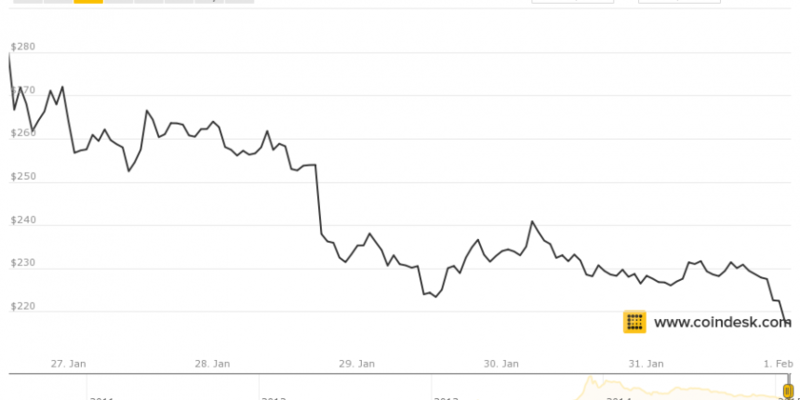 The bitcoin price has fallen 11% over the last seven days, opening at $254.51 on 26th January and closing at $226.40 on 1st February, according to the CoinDesk Bitcoin Price Index. The price spiked at the start of the week, however, when it hit a high of $307.97 on the back of major announcements from Coinbase, which included its record-setting $75m funding round and the launch of its US-based exchange. The price jumped by more than $50 in intra-day trading. Price gains were quickly lost again as successive trading sessions took their toll. The biggest dip occurred on Wednesday, as the price fell by about $30. By Saturday, a bitcoin was trading at $216. A gain would come on Sunday, as the week closed, taking the bitcoin price to as high as $231.92, but closing at the $226 mark. This closed a trading week book-ended by significant gains that were ultimately outweighed by losses. Even as the initial bullish sentiment around the announcement of Coinbase’s new exchange wore off, the launch left a trail of questions in its wake. State regulators in California and New York both made statements refuting initial reports that Coinbase’s exchange had been licensed to operate there. The firm responded, saying that it was operating in a regulatory “grey zone” that allowed it to take customers from those states. The district attorney of Manhattan meanwhile told a gathering of anti-money laundering specialists that he was watching efforts to take bitcoin “mainstream” like the Coinbase exchange with “intense interest“. Cyrus R Vance Jr said regulated exchanges benefited law enforcement efforts to police terror and financial crime. Other exchanges seemed intent to re-double their efforts for market-share. Hong Kong-based ANX acquired CoinMKT in a bid to expand in the US market. Japan’s BitFlyer raised a third round of financing as it planned to expand overseas, hinting at the possibility of a Singapore outpost. In the UK, the team behind an authorised e-money issuer has launched an exchange called DSX linked to that entity, creating a level of scrutiny over the fiat funds that must flow through the issuer before entering the exchange. Troubles for miners, meanwhile, continued apace. It was revealed that CoinTerra has filed for Chapter 7 bankruptcy, amidst a rash of complaints made by customers of the firm made with the Federal Trade Commission that were published after a Freedom of Information request made by CoinDesk. Exchanges recorded a healthy increase in volume over the week, with 5.34 million coins changing hands between 25th and 21st January, according to data from Bitcoinity. This represented an increase of 33% over the previous seven-day period. The major US dollar exchanges, Bitfinex and Bitstamp, recorded significant volume increases, with Bitfinex showing a 71% rise in volume and Bitstamp showing volume growth of 62% for the period. A note about data: Volume data for ANX has been excluded from weekly volume aggregation because Bitcoinity has over-counted the exchange’s total volume in its aggregation function. ANX uses a “blended” order book that shows total volume traded across all currency pairs, according to Jess Chan of ANX. 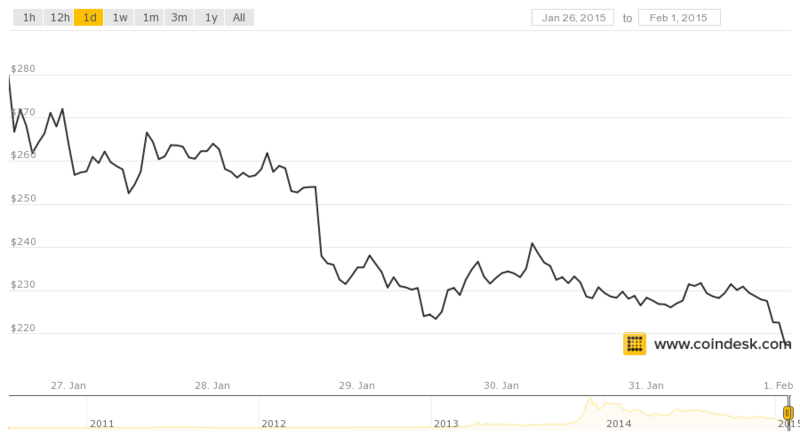 Bitcoinity summed this data for each currency pair, causing ANX’s total volume to be over-stated. This issue was first raised last week by Kraken’s Brian Bowman.